We're all going on a......summer holiday!!!! That's right...I am again going to be absent from my blog...and also the allotment but only for a week and this time I have a very good reason...we are going away for a week. 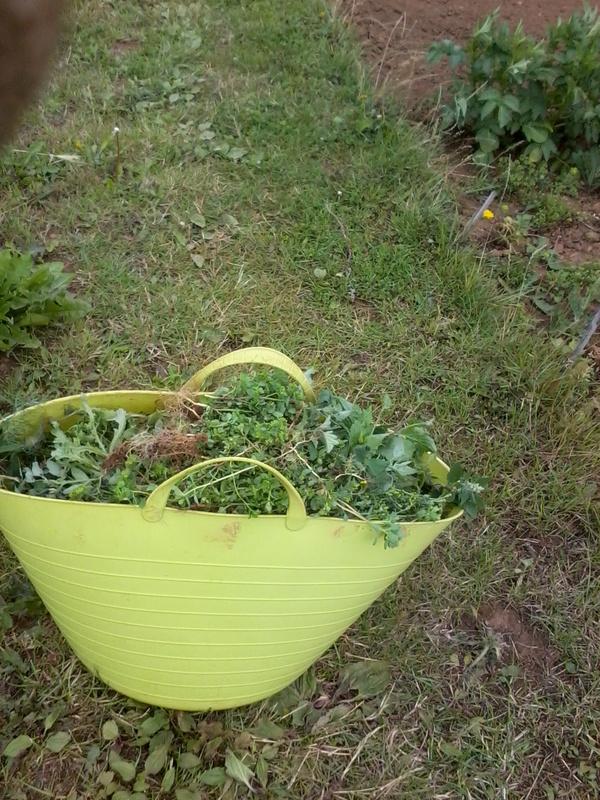 It's been a hectic day with exam results, college enrollment, packing and washing but I did manage to get down the allotment and harvest a few vegetables. 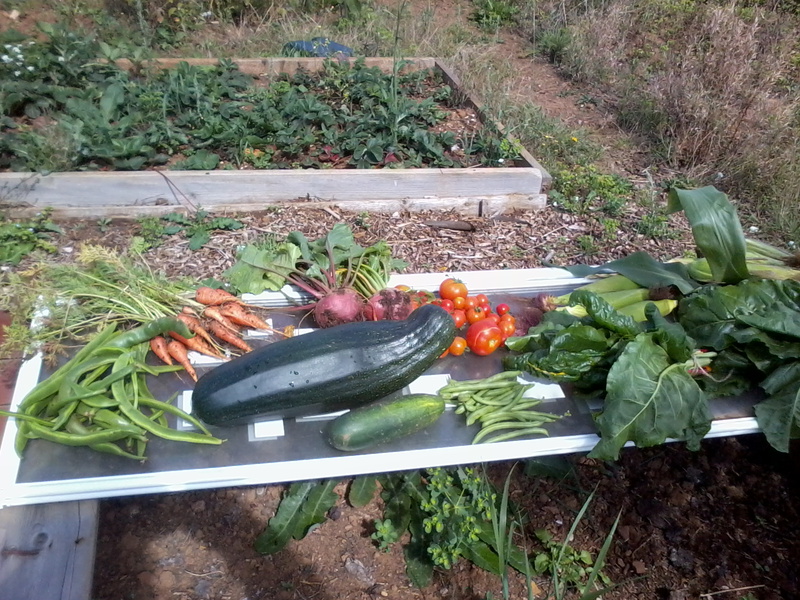 The harvest from today...and I was only up the allotment half an hour!! 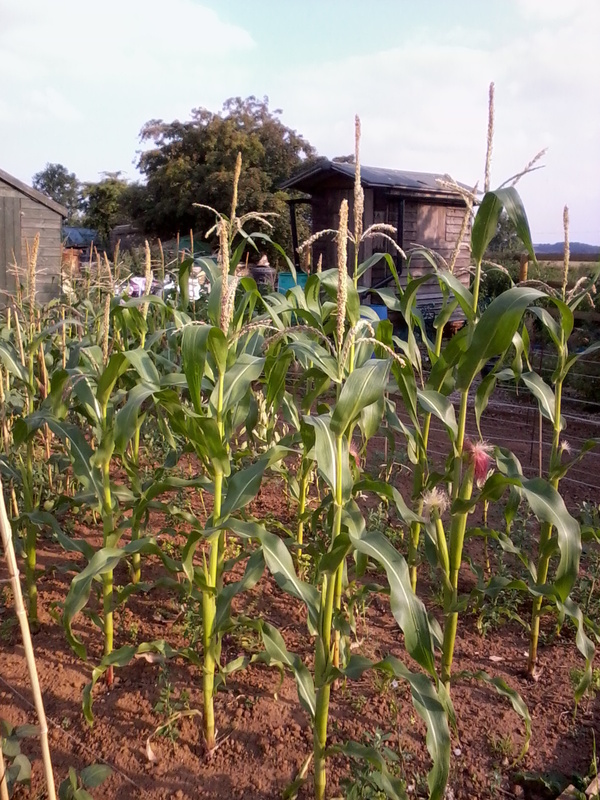 Today's harvest wasn't for me but for my cousin who gives me year round free manure and also for my sister...I am quite envious that they are going to be eating the first sweetcorn...but there is plenty for me when I arrive home in a week. 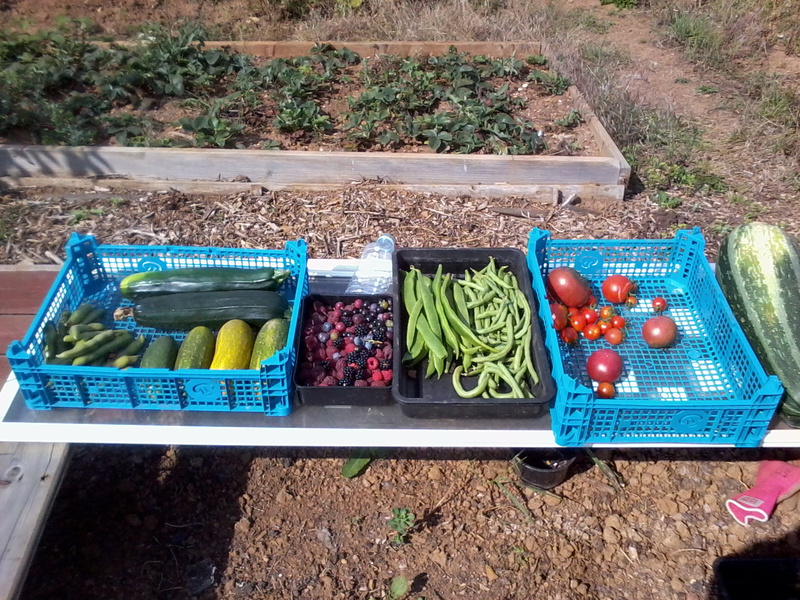 I harvested runner beans, french beans, beetroot, cucumber, marrow, rainbow chard, sweetcorn, baby-corn, spinach beet, tomatoes, courgette and potatoes. This ones for Mal...I think you are probably beating me hands down!! Above is my celeriac...or lack of it. I had trouble getting hold of seeds and then when i finally did they were a long time germinating and this is as big as they have got. I think it's safe to say i have failed at celeriac again this year but I will not give up quite yet and will be trying again next year...so how's you celeriac doing Mal?? So that's all for now hope you enjoy your holiday weekend and I will be back posting again as soon as I get home. Well we had severe weather warnings issued for Monday/Tuesday for heavy rain and flash floods...we got a little sprinkling of rain and that was our lot!! It's been quite a nice week. Not too windy and temperatures in the late teens and low twenties. Often the days have been cloudy but i don't mind this too much. We really could do with a couple of days of decent rain for the gardens but we aren't at the desperation stage yet. I can't believe how quickly the nights are drawing in...sun is now setting about 8:45pm. Hope everyone else is getting some nice summer weather too. I don't 'gnome' what to do?!?! 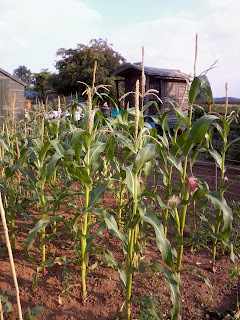 Well I fully intended on visiting the allotment today and then writing a post about harvesting my sweetcorn. That didn't quite go as planned though so I have just pulled a post out of my head as I thought it would be nice to see what you think about this thing I think I might want to do!! I do love my animals and think they give a bit of character to my kitchen which I like to keep unfussy and basic for ease of cleaning and hygiene reasons. However there are the times when i have to get them down and wash them so I am wondering whether they should maybe go into the garden or if they would even make a nice addition to the allotment...or would I miss them too much if i moved them from my kitchen after such a long time?? They have been residents of the house for about 8 years now...So basically I'm asking you all what you think....or how maybe you would feel about moving them...just a little insight to others thoughts might help me make a final decision. These aren't the only ones i have...I also have two ducks and three chickens but these aren't outdoor ornaments so would have to stay where they are...which is another things that is making me ponder what to do....please help!! 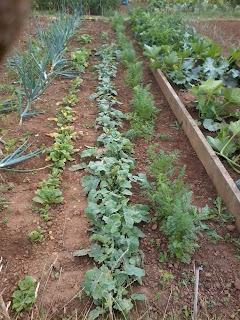 Some Allotment pictures to look at. I'm quite tired after a busy day so here are some pics for you to have a look at today. 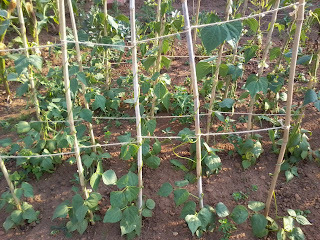 French beans and baby corn. 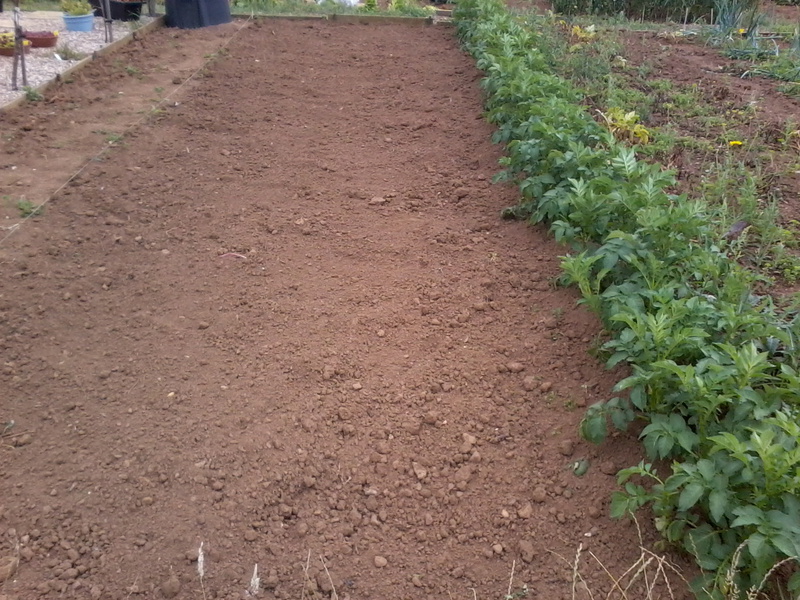 Rainbow Chard, spinach beet, turnips, swede and carrots. One of the first harvests. The above were all taken about 4 weeks ago so you can imagine how much harvest I have had since then.....the babycorn has been delicious and the dwarf beans have been plentiful this year and I have been freezing plenty for the winter. Well I had a very quick trip to the allotment this afternoon (only and hour!) and it proved very fruitful indeed!! It was nice to finally see the tomatoes ripening which are planted outside on the allotment and I manged to harvest quite a few from the plants outside as well as inside. 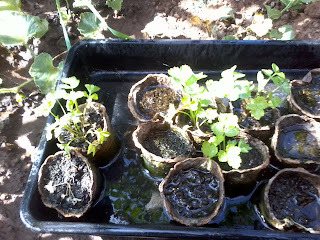 Now I am just waiting for those in the pots in the garden to start to show signs of ripening. 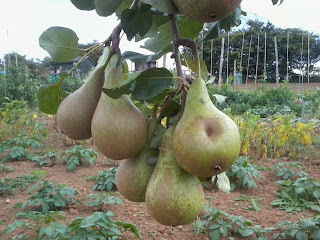 Just a few of the pears which the tree planted only last year has produced. 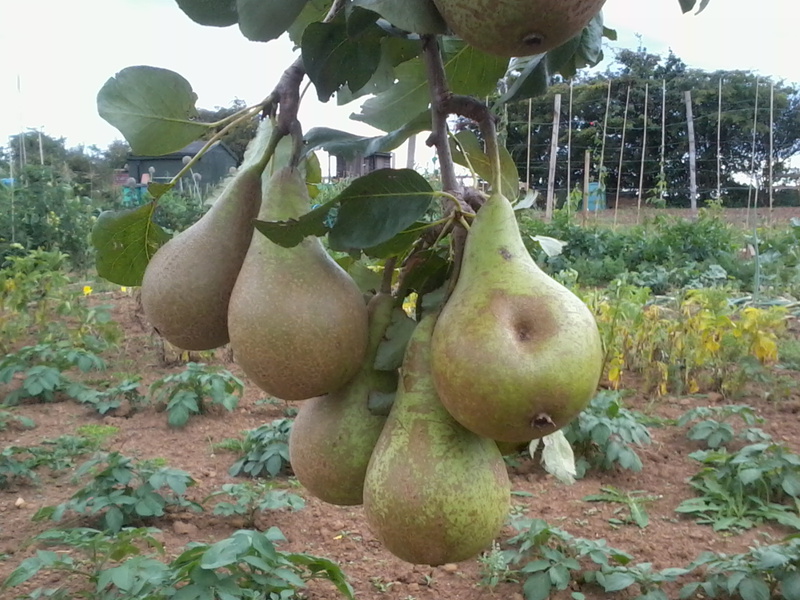 The pears are also looking good and I picked a few for my son who is the pear lover of the household...it was also nice to see only one windfall which was being thoroughly enjoyed by the wasps!! 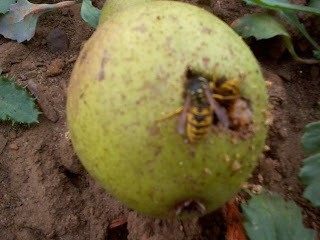 Wasps enjoying the windfall...nice to see nothing going to waste!! 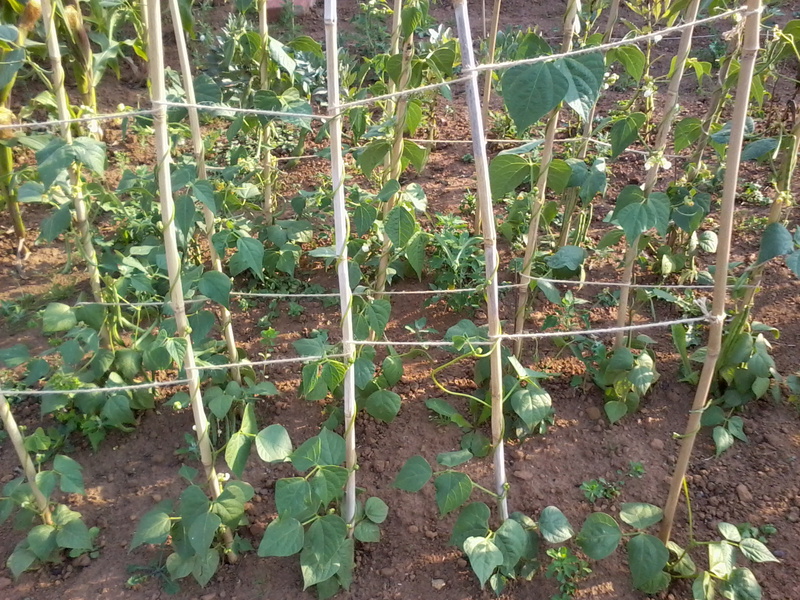 As well as tomatoes and pears I also picked some runner beans, carrots from one of the containers, cucumbers, iceberg lettuce, french dwarf beans and and chard. 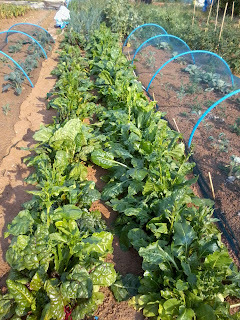 I had to do a blitz through the chard and spinach beet patch cutting off all the long stems which had bolted and started to flower. This prolongs the life and also neatens up the allotment. The Desiree potatoes coming through. Finally above are the Desiree potatoes that I planted just a few weeks ago. 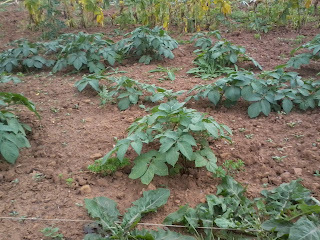 they seem to be doing nicely now and in the background you can just see the tops starting to die off on the King Edwards. So that's it for today...just a quick post really...lots more harvesting to do but I am hoping to get back to the allotment for an hour or two tomorrow at some point. 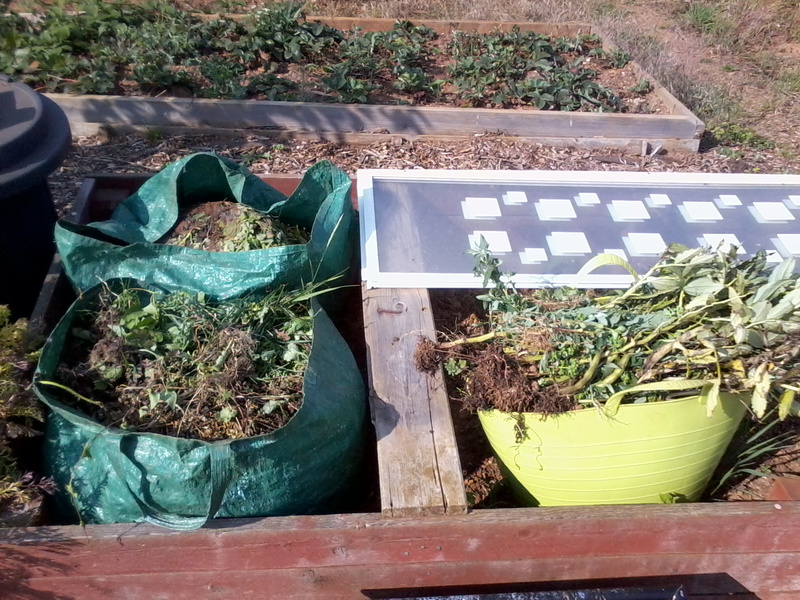 So I mentioned in my post a couple of days ago that although I had been absent from the computer I hadn't been totally absent from the allotment...so what have I been doing down there??? Well not much to be honest but here is a little update. I managed to finally get the ground cleared and the rest of my main crop potatoes in. The variety is Desiree. I got a good crop from them last year and they have already started coming through. And triple again what you see above and you will about have my workload! So that is pretty much all I have been doing....but I guess it's par for the course at this time of year...and I bet you are all in the same boat. 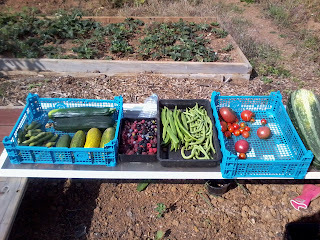 Of course there has been the delight of harvesting my produce too but I'll save that for tomorrow!! No allotment activity today as I have been majorly busy but like I said I have lots to tell you and have been keeping up with the photos in my absence so today is the day of the beetroot!! I have grown beetroot for the last two years and the seeds I have always planted have been boltardy and I have always had an excellent germination rate and lovely healthy veg to harvest at the end. 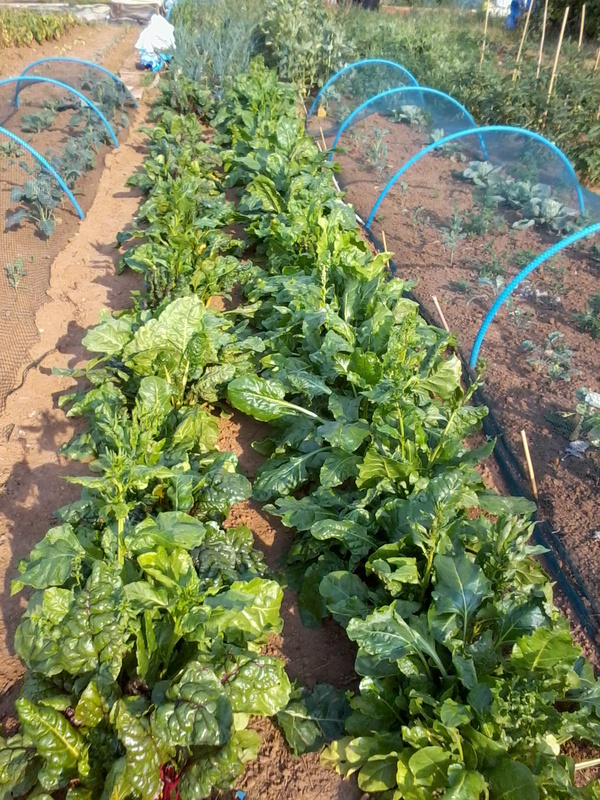 This year however I decided I would go for some of the different beetroot. I kept seeing the golden coloured beetroot and the stripey type in the seed catalogues and the shops so I decided I would give them a go. I can't remember the names of the seeds and I didn't write them down but I have to say I'm not overly impressed. Germination rate wasn't good and the vegetables haven't grown to the size I have become accustomed to....however that isn't the most disappointing thing about the beetroot...it's the colour!! Although when harvested they look lovely and vibrant once coked the purple lacks the deep luster of the boltardy, the pink and white just blends together to give a very pale colour and the golden yellow represents more of a dirty brown. the taste is fine....just like the boltardy beetroot really but the colour is a little off putting and doesn't look so enticing on the plate. I'm glad I decided to give them a go but next year I think I will go back to the boltardy and stick with that from now on!! 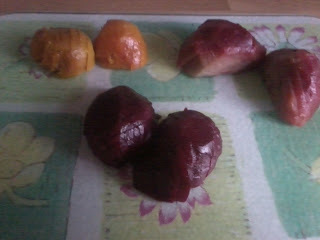 I slow roast my beetroot in the oven on a low heat until it slices like butter...totally divine!! Thursady Forecast...weeks 26-32...yeah it's another catch up!! So here I am...after quite a long time of not being on the computer at all and so I hope you haven't all abandoned me. The weather has been the typical British summer over the past few weeks though we haven't had as much rain as usual when it has come it has been major downpours which have soaked you thorough to the skin almost immediately. The heat side of things has been up and down too...clothes can change from shorts and strappy tops to jeans and jumpers on a daily basis. So basically then nothing new on the weather front!! I have been really busy with home, work and the allotment which is why i haven't managed to sit down at the computer of late but routine is starting to settle in now and although I haven't posted lately I have been taking photos and so over the next few days will be updating you on whats been going on. Right now though I am going to leave you with this and spend a little time catching up and commenting on some of my favourite blogs. I promise I will be back tomorrow with pictures! !